Leaders earn respect. It’s passed from one person to another when an act of service, kindness, or extreme intelligence is displayed. But, how do leaders earn respect, and catapult their team forward? The answer is volunteering. Respect is earned in the trenches. When things get tough, and when the obstacles seem numerous. Strong leaders roll up their sleeves, and vest themselves. Act without being asked! But, the real impact of volunteering extends beyond the internal organization. Today, a strong organizational profile includes corporate social responsibility (CSR); sustained engagement in the surrounding community. Volunteering requires leaders to stand up, and stand out. 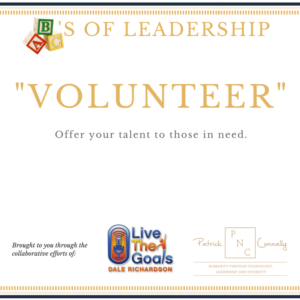 It’s important for leaders to volunteer their time and energy, but it’s more critical to encourage, and support the volunteer efforts of others. Supporting the efforts of others demonstrates acceptance for diverse ideas, and a commitment to the bigger picture. Commit to your community, to your people, and to their passions. Want more on the power of volunteering? Check out my partner Dale Richardson’s thoughts in his Live the Goals podcast here! “The ABC’s of Leadership” is a web series highlighting principles of leadership. Each day, we’ll highlight a new focus area and concept. Done in partnership with Dale Richardson, a Podcast Host and John Maxwell Team certified speaker, trainer and coach, we’ll also offer a podcast exploring each idea further. All of your blogs have been insightful. I especially appreciate this one. Thanks for sharing! Thank you Valerie! Happy to be sharing meaningful content with strong leaders like yourself! Stay tuned for more insights!